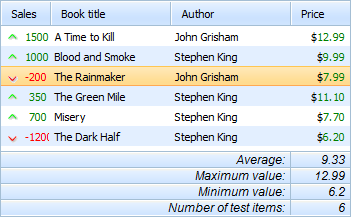 The library provides a list of statistics counters that can be used to get some total value in the footer of a column. Statistics counters are set by the method attachFooter(). data - an array of 2 elements presenting the text before/after the counter. data contains the text before, data - the text after the counter. The _stat_in_header() method provides automatic processing of the counter, e.g. invokes the calc() function, sets the calculated result, etc. The name of a counter must start form stat_. To set the same numeric format for the counter as the one set for the related column, you may use the inner grid function _aplNF(value,column_index). In this case, the counter will take the format set by the setNumberFormat() method. You have the possibility to integrate the value return by any statictics counter into HTML. The function can be called both before and after grid initialization.